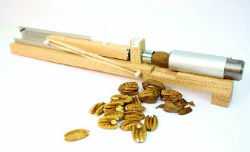 A convenient way to crack pecans and other nuts. Rubber band powered and made from the finest red oak and aluminum extrusions. It is fun and easy to use.